(next entry) Smart Finishing in RhinoCAM Standard! 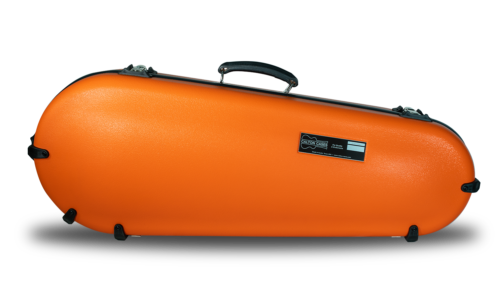 Calton Cases located in Austin, TX manufactures custom fit musical instrument cases through a world-wide network of instrument dealers. 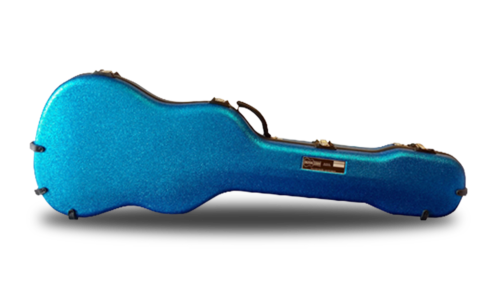 Keith Calton started the company in 1969 – handcrafting well-made, nearly indestructible cases for devoted Musicians and Collectors. As Keith put it, “For Quality & Endurance”. 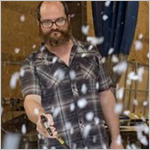 With the help of CAD/CAM and CNC machining technology, the company that Keith founded is still thriving today and the cases they produce really are, well, nearly indestructible! 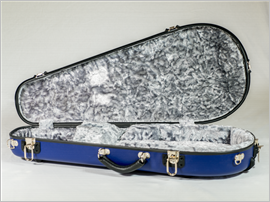 Calton Cases manufacturers cases for 10 different lines and 350 different types of musical instruments, each custom fit to the customers exact specifications. 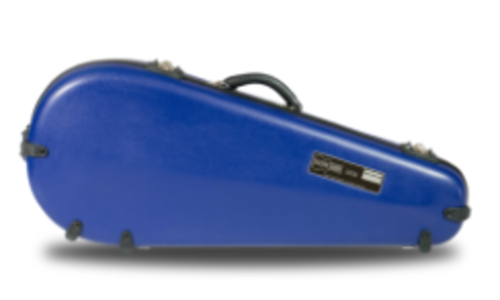 The 10 instrument case types the company manufactures are shown below. 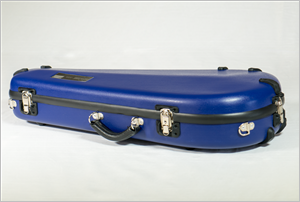 The 10 music instrument case styles manufactured at Calton Cases. Anthony Pelosi has been with Calton Cases for 10 years, first as a fabricator, then a CNC operator and now as a Product Designer and Innovation Lead. Anthony started his career with a 4-year degree in Asian studies but with a love for music and good with his hands, he started manufacturing musical instruments for various companies. He soon became a hands-on fabricator of many different skills so he decided to go back to school and take some drafting classes. Today Anthony is spearheading the use of CNC technology at Calton Cases. 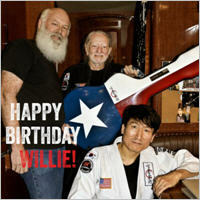 His CAD software of choice is Rhinoceros from McNeel & Associates. The CAM software that Anthony relies on to run his 3 Axis Laguna CNC Machining Center every day is RhinoCAM from MecSoft Corporation. We recently sat down with Anthony to discuss his use of RhinoCAM software. Anthony walked us through the process of creating a Calton Case. It begins with two mold cores (i.e., plugs). The cores are machined from a high-density polyethylene similar to a modeling board. The two cores are then used two thermoform ⅛” thick textured ABS cavities, one for the top and one for the bottom of the case. 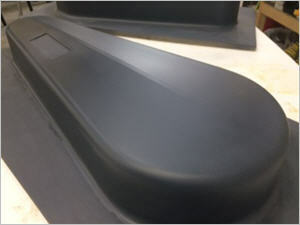 The textured ABS cavity forms are then used to layup the actual top and bottom case components from durable multi-layered reinforced fiberglass. We should interject here that when Keith Calton started the company in 1969, these cores were hand carved and hand textured in a process that took up to 2 weeks! Today, Anthony can produce a production core mold in 1 hour! 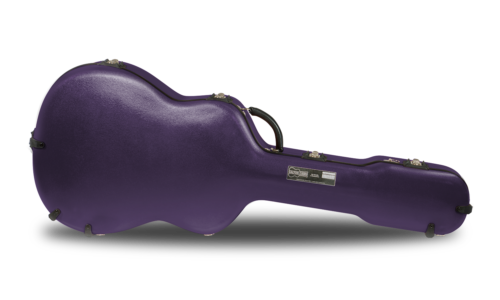 The interior of the case is outfitted with cloth and foam inserts fitting the customers exact mandolin dimensions. 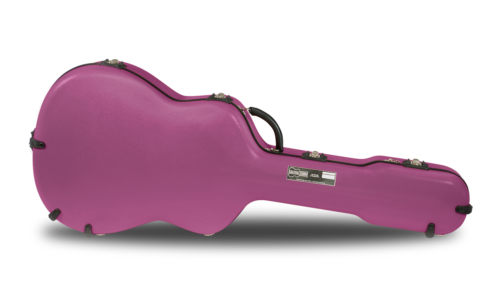 The outside is fitted with hardware, sealing and labeling that protect the instrument from all-weather conditions. 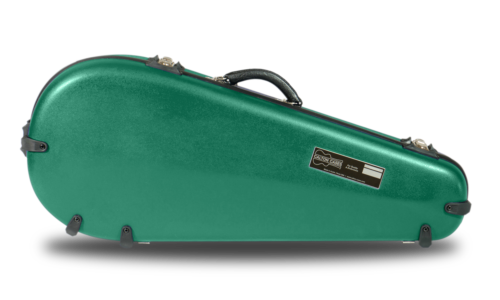 The end product is a sturdy and durable case that will provide lifelong protection to the instrument enjoyed by Musicians and Collectors alike. How durable are Calton Cases? Check out this video! 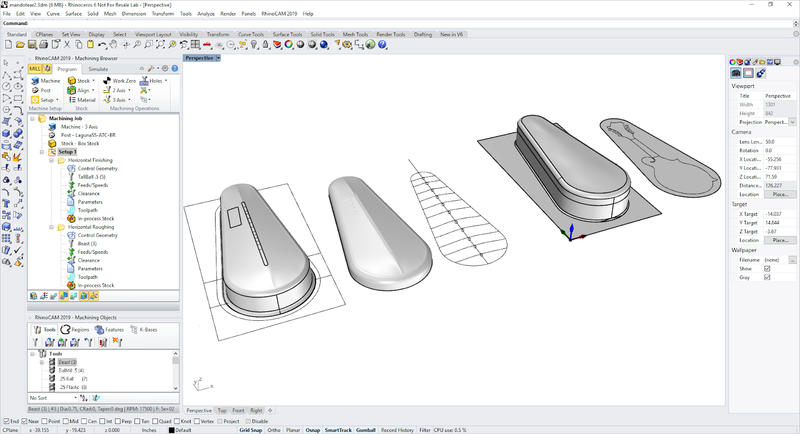 The master CAD/CAM part file for the mandolin case mold cores is shown below in Rhino 6.0. 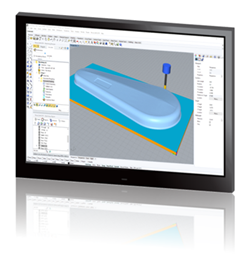 It contains the 3D models of the top and bottom core as well as interior instrument templates and other CAD data. 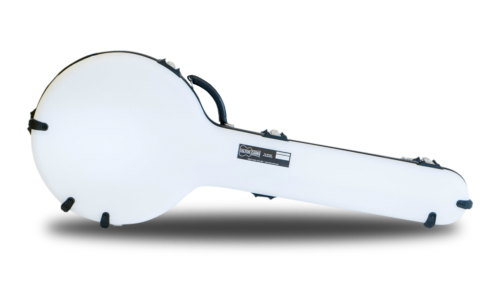 An entire mandolin core measuring 18” x 35” is machined from a 3D polysurface model requiring only two RhinoCAM toolpath strategies! The only RhinoCAM selection is a simple 2D rectangle used to contain the outer boundary of the toolpaths. For bulk material removal a 3 Axis Horizontal Roughing toolpath is used. This removes material in Z levels. Finishing is performed with one 3 Axis Parallel Finishing (or Horizontal Finishing) toolpath! After coming off the CNC Machine the cores are lightly sanded with 120/220 sandpaper and then given a spray coating to withstand the temperatures of the thermoforming process. 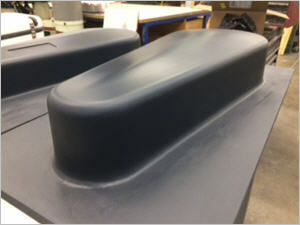 The Rhino file and the two resulting thermoform core molds are shown below. 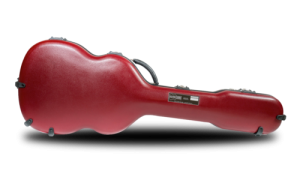 The Rhino 3D part file for the mandolin case is shown with the RhinoCAM plugin loaded on the left. 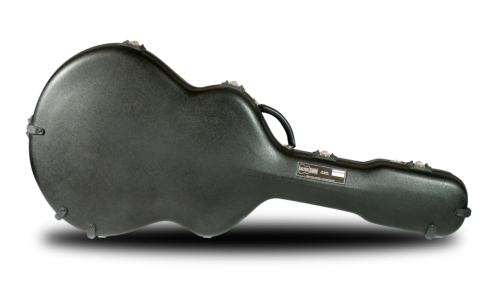 The two mandolin case core molds are shown. The case top is on the left and the bottom is on the right. “With just two operations, Horizontal Roughing & Parallel Finishing, we have a master thermoform mold core. It’s really just like magic! The roughing and finishing toolpaths and cut material simulations for the top case core are shown below. (A) and (B) show the Rhino 3D model and RhinoCAM box stock. (C) and (D) show the 3 Axis Horizontal Roughing toolpath and cut material simulation. (E) and (F) show a 3 Axis Horizontal Finishing toolpath. In (D) you can see that the roughing operation cleared all of the material using a ¾” diameter flat end mill including a finishing pass on the flat bottom surface. In (E) you can see that the finishing operation automatically cuts the vertical sides and top of the core using a ½” diameter ball mill. The ¼” radius at the base of the core is machined automatically. Machining the bottom core uses the same toolpaths as the top just regenerated with the bottom core 3D model displayed! Click here to see the cut material simulation video of these two mold cores! The 3 Axis Parallel Finishing toolpath for the bottom core mold of the mandolin case is shown. 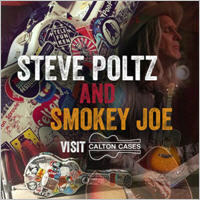 We want to thank Anthony Pelosi and the team at Calton Cases in Austin, Texas for allowing to showcase their work. 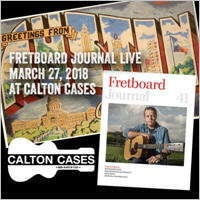 To learn more about Calton Cases we invite you to visit them at their home page, Instagram, Facebook and Pinterest. RhinoCAM – MILL is available in five different configurations (Express, Standard, Expert, Professional and Premium). The part shown here was programmed using the Professional configuration. Here are some additional details about each of the available configurations. For the complete features list, visit the RhinoCAM Product Page.